Although I'm not one to read too much into coincidence, I would like to point out that Julia Child and I share a birthday: August 15th. So while I was chowing down on hamburgers and buffalo wings, Julia, no doubt, was eating Dover sole in culinary heaven shaking her head at my American ways. 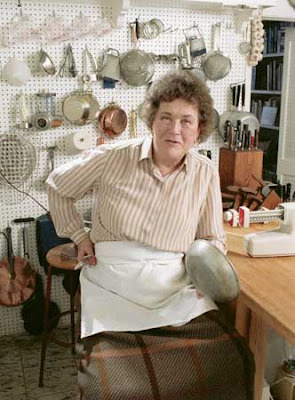 The Library has a large collection of Julia's works, both by and about her, including the very recent biography Julia Child by culinary historian Laura Shapiro. The two-volume set of Mastering the Art of French Cooking (first editions, no less) are available along the shelves in the Main Reading Room, side-by-side with Julia's tome The Way to Cook. My Life in France, Julia's collaboration with her nephew Alex Prud'homme, is also in the stacks and, in my humble (Leo) opinion, is one of the most enjoyable reads of the past few years. Although the Library doesn't have the DVD set of PBS series The French Chef, a rental is highly recommended. You may not be able to watch all episodes in one sitting, but "The Omelet Show" is worth multiple viewings alone. There are also some wonderful websites devoted to her life and kitchen, with especially moving tributes following her death in 2004. The Schlesinger Library in Cambridge is the proud holder of her papers, as well as Child's cookbook collection which she donated to the Schlesinger in 1990. In addition to Julia's papers, they also house the papers of Simone Beck and Avis De Voto, who was instrumental in getting Mastering published. And finally, the Library will have a special event on October 10th called Julia Child in America. The panel will include Molly O'Neill, Dan Barber, Laura Shapiro, and David Kamp. Moderated by Melanie Rehak. Tickets are 15 dollars.